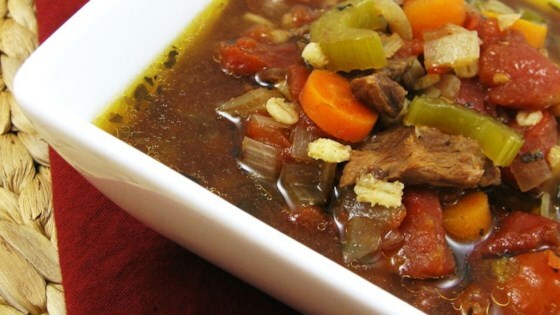 "Slow cooker, hearty, easy. Serve with a hearty bread, and enjoy." In a slow cooker, cook chuck roast until very tender (usually 4 to 5 hours on High, but can vary with different slow cookers). Add barley and bay leaf during the last hour of cooking. Remove meat, and chop into bite-size pieces. Discard bay leaf. Set beef, broth, and barley aside. Heat oil in a large stock pot over medium-high heat. Saute carrots, celery, onion, and frozen mixed vegetables until tender. Add water, beef bouillon cubes, sugar, 1/4 teaspoon pepper, chopped stewed tomatoes, and beef/barley mixture. Bring to boil, reduce heat, and simmer 10 to 20 minutes. Season with additional salt and pepper to taste.